My haut, retour au début 5; which is your favorite? Current Members: Who's your favori member? Has anyone seen ou have this exact version of Californication? what is the pre sale mot de passe to buy tickets early? I'm looking for A song that Red Hot Chili peppers playd as an intro in A concert in Israel: the song starts in 22:54- right after Otherside. please help! Im looking for this song for years. thank you!!! I have been a fan of Red Hot Chili Peppers since I was twelve years old. In honor of my nine-year fandom of the band, I decided to discuss my haut, retour au début ten favori Red Hot Chili Peppers songs, so here it goes. "Under the Bridge" seems to be a favori among fans, and I can see why. The topic is a universal emotion, loneliness. Everyone feels lonely from time to time. Even though I don't have a reason to be lonely, I do feel lonely from time to time. That's why I feel so connected to this song. Hello, everyone! ChiliPepperLuv here, and today, I'm écriture a review on the new album, The Getaway. I am expressing my opinion on the artwork, my favori song(s), and my global, ensemble impression on the album. According to lead singer, Anthony Kiedis, the new album will be released in 2015. However, long time producer, Rick Rubin, will not produce the new album. Anthony a dit that he and his band mates are looking to men who are good at producing records, and that when they have a producer, they will confirmer it. 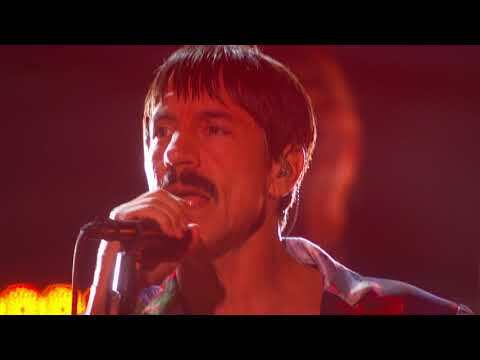 The Chili Peppers are experimenting with new material, and Anthony a dit that this was some of the best material that he and his band mates have made up in a long time. The suivant album will be the first album that Rick Rubin will not produce since the 1989 album, Mother's Milk. 1. toi listen to them every single day. 3. You're looking vers l'avant, vers l’avant to their suivant song. 4. toi drool every time toi see a picture ou video of any of the band members. 5. toi compare people toi know to members of the band. 6. toi can relate to any of their songs. 7. toi sing your favori songs par them out loud. 8. toi own RHCP merchandise ex. T-shirts, CD's, drinking glasses, etc. A couple of days before it was reported par various RHCP sitesthat Anthony and possibly Flea would be taking part in the Surfrider Celebrity Expression event at Malibu Lagoon State Beach, north of Santa Monica. par blind luck during my holiday touring south to north California I happened to be leaving Hollywood and driving on the coast north to Santa Barbara on the jour and time of the surf event. Red Hot Chili Peppers bio with liens to amazing videos. a question a été ajouté: Has anyone seen or have this exact version of Californication? What is the name of their book for the fans (2014)? If toi like Red Hot Chilli Peppers, you'll l’amour ANITA MAJ!